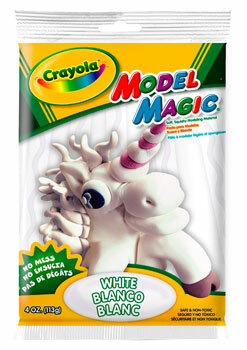 Home > Art Supplies > Modeling Clay > Crayola Model Magic > Crayola Model Magic White 4 oz. Model Magic White 4 oz. Soft, squishy modeling material. Lightweight and spongy modeling material, even after drying. Won't crumble or stick to skin and clothing. Fun to decorate with Crayola Markers, Paints, Glitter Glue or other decorative items. Great for projects at home or school. Safe and Non-Toxic.